The following is a guest post from fellow personal finance blogger, Dan of dinks.co. He’s a home owner who knows a thing or two about HELOCs. My (Aaron) wife and I recently opened up home equity line of credit – so this post is timely for us. Taxes and interest rates are changing this year for most Americans; the new tax plan meant many people are getting more money in their paycheck, getting bonuses from their employers, or seeing a lower overall tax bill. Others saw their deductions lowered slightly, or they didn’t get as much of a break as expected. Meanwhile, interest rates have gone up as well, meaning new rates and existing variable rates are going to increase. This affects everything from credit cards, to personal loans, to student loans, and more. One credit product that is seeing major changes this year is the home equity line of credit, or HELOC. HELOCs have been a mainstay credit product for many years. For homeowners with 10-20% equity in their home, a HELOC is often the perfect way to finance home improvement projects and other major purchases or cover unexpected expenses. In fact, until recently, its lower interest rates, more flexible payment plans, and tax advantages have historically made it a smarter use of credit than many credit cards. This year, however, HELOCs are going to see two major changes in the realm of taxes and interest rates. Homeowners who waited until 2018 to get their HELOC will find it to be far more expensive now. Let’s take a look at what’s different this year. Up until this year, home equity lines of credit came with beneficial tax deductions. Homeowners who dipped into their HELOC could deduct the interest paid on the outstanding loan, which often translated to big savings at tax time. In 2018, however, the criteria for deducting that interest changed, leaving some homeowners out to dry on tax benefits. The financial world, or just homeowners in general, was shocked to learn that HELOC interest payments were no longer deductible, leading the Internal Revenue Service to clarify the new laws in February 2018. It turns out that there is still one situation in which homeowners can claim that HELOC interest: home improvement projects. In order to continue deducting interest, the HELOC needs to be financing a home improvement project or renovation—basically the major purpose for using a HELOC anyway. Those who take out money from their line of credit for debt consolidation, paying for education expenses, or other purposes will no longer be able to deduct that interest on their taxes. That change means HELOCs will be more expensive over time for borrowing home owners collectively. Some financial lenders are advising consumers to consolidate any HELOC balances with their existing mortgages in order to maximize the interest deduction under the new rules. Even if the HELOC would not qualify for the tax deduction under the new law it can be if it’s rolled into a mortgage. Aaron gives LendingTree a try when he and his wife decide to refinance their house. The Federal Reserve raised interest rates by a quarter of a percentage point in December 2017, up to 1.5% from 1.25%. More rate hikes are expected to come later this year, although there’s some debate as to how much or how many. Even with just one rate hike in December, that quarter of a percent was enough to push HELOC rates up as well. Where in October 2017 the average rate on a $30,000 HELOC was 5.39% according to LendEDU. When you look at today in the increasing rate environment, that average has risen. By mid-March, the average HELOC rate pushed close to 5.70%. If overall rates continue to rise, this figure would be expected to rise accordingly. That’s significant because HELOCs only have a 5- or 10-year “draw period,” during which funds can be taken out, repaid, and taken out again. Once the draw period is up, the line of credit shifts into a product more like a loan, in which standard repayment terms apply—and interest only payments suddenly turn to more traditional interest/principal payments. Homeowners with existing variable-rate HELOCs will see not only a payment amount increase due to the end of the draw period, but exponential growth due to higher rates on that outstanding balance. 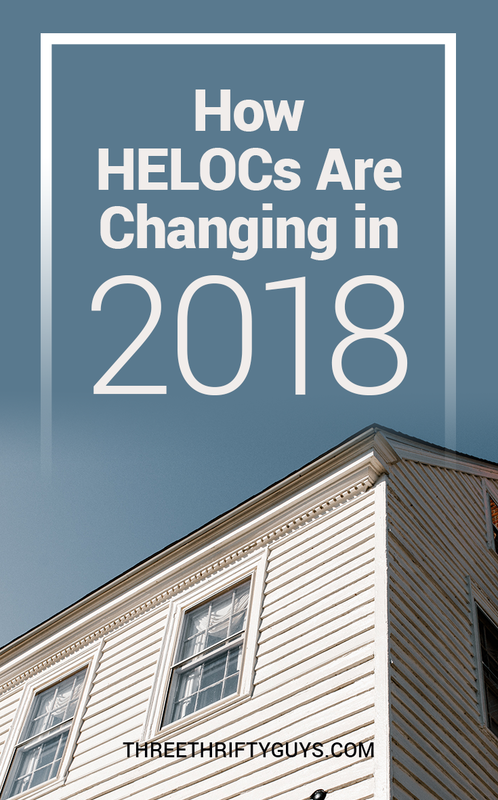 Meanwhile, homeowners looking to capitalize on their house’s equity will now be paying far more over the course of a HELOC’s term than they would have if they took out the money even a year ago. Because most home improvement projects take less than 2 years, a family could have taken a new HELOC, finished their project, and possibly even paid back the outstanding balance before the new rates and tax laws kicked in. Now, however, they’ll pay the higher rates—and possibly not get the tax break, depending on the purpose for the HELOC. The new rules and rates can be confusing on the first read, especially since HELOCs have stayed largely the same for the last 20 years as a go-to financial product financing everything from college, to new cars, to a new kitchen. The IRS clarifications, however, make it clear that there are still ways for homeowners to deduct the interest on their HELOC, and there’s still a way to get out of those higher rates if you’re carrying an existing balance on your line of credit. If you’re still thinking about taking advantage of the equity in your home with a HELOC, then you might want to wait a few months. Some advisors say not to wait too long since rates could still go up significantly by the end of 2018, putting you in a worse position. If your purpose is home improvement, you could get in now at the lower rates and still take advantage of the tax break. If you’re looking for debt consolidation or some other purpose, however, you can expect a different situation compared to a year ago. Do some research, and talk to a financial planner to find out the best steps for you. TTG may earn commission on any purchases made via the links in this post – at no cost to you. Thanks for helping to support our site.